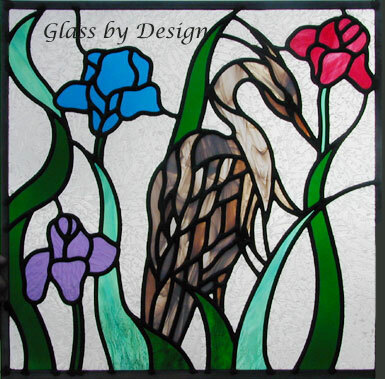 "GREAT BLUE HERON" LEADED STAINED GLASS WINDOW CUSTOM AT GLASS BY DESIGN. Great Blue Heron stained and leaded glass window was 20" x 20". Stained glass flowers and bird; gluechip glass was the background.